AP DEECET 2019 Hall Tickets Can be Downloaded from dietcetap.cgg.gov.in. DEECET AP 2019 Hall Ticket should be kept while you are going to the examination hall and also preserve the hall ticket for future reference like counseling or certificate verification. AP DEECET 2019 Hall Tickets: Govt. of AP, CSE and DEECET Officials issued the AP DEECET 2019 Notification on 05/04/2019 and CSE AP invited the online applications of D.Ed Course Entrance Test through its official website deecetap.cggg.gov.in from 04/04/2019 to 22/04/2019 as per schedule from the Inter passed and eligible candidates who intend to take admission into 2 year Diploma in Education (D.Ed.,) course in Govt. DIETs and Private D.Ed Colleges for 2019-2020. DEECET AP 2019 Exam will be conducted on May first week in all 13 Districts of the State by by the CSE, Govt of AP. Interested and eligible candidates were applied for this stream. Online applying process was completed on 22/05/2019. Officials will provide the download link of hall tickets on its web portal. 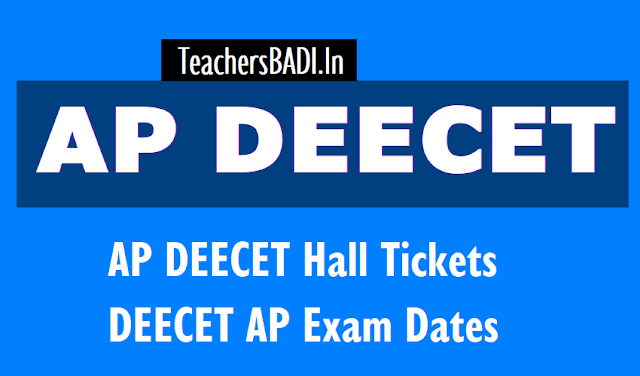 Candidates can download their AP DEECET 2019 Hall Tickets from 10/05/2019. In case any candidate could not download the Hall ticket she/he should contact the AP DEECET O/o. Director of School Education, Saifabad, Hyderabad - 04 between 10.30 AM to 5.00 PM on all working days in person only giving details of the journal number of the fee paid, reference number of the application submitted, a copy of the printout of the Application form and one photograph (as pasted on the application form). For any problems in download of hall-tickets call Ph: 040 23120331,23120332 (Call Time : 10.30 A.M to 1.00 P.M & 1.30 P.M to 5 P.M on working days) Request for issue of duplicate Hall Ticket will not be entertained after the examination in any case. AP DEECET 2019 Exam will be conducted through online mode i.e Computer based entrance exam in June .................., 2019 and Hall tickets can be downloaded from the deecetap.cgg.gov.in web portal from May 19. AP DEECET Web Portal News "AP DEECET Exam Date new dates: From ...............-06-2019 to .................-06-2019". 1. Read all the instructions carefully on Side-I of OMR Answer Sheet before you start answering. Verify in the examination hall, Whether you got the Correct Question Paper Booklet Code as printed in your OMR Answer Sheet. 2. Candidates will be permitted into the examination centre 30 minutes before the commencement of examination and will not be allowed to leave the examination hall till the end of the examination. Candidates will not be allowed into the examination Hall after the commencement of the test. 3. If the photograph is missing on Hall Ticket, please paste your passport size photograph in prescribed area duly attested by any Gazetted Officer, and a Xerox copy of the same Hall Ticket is to be handed over to the invigilator. 5. Hall Ticket must be produced at the Test Centre and also in examination Hall, failing which he/she will not be allowed to appear for the test. OMR Answer Sheet will NOT be valued, if the candidate writes any irrelevant matter, symbols, religious marks, prayers or identification marks on any part of OMR Answer Sheet as it amounts to malpractice. Rough work should not be done on OMR Answer Sheet. 6. Candidate must carry only (i) Writing pad (ii)Blue/Black Ball point pen into the Examination Hall. Use Blue/Black ball point pen only to darken the circle of correct answer in OMR answer sheet. Do not use Pencil to darken the circles in OMR answer sheet. 8. Adoption of any kind of unfair means at the time of test or any act of impersonation, will disqualify the candidate from appearing the test. 9. Hall Ticket must be preserved till the time of admission into the D.Ed College. If any correction is noticed in particulars given in Hall Ticket (except group), the students can write a request letter to the DSE Telangana Officials by enclosing copies of evidence. Step 6: Remember to carry it on DEECET Exam.